The Dallas-Fort Worth metropolitan area is one of the nation’s largest metros. With almost 7.4 million residents, the region grows daily. In fact, 400 people move to DFW every day. Consequently, a region this size needs talented Dallas-area commercial real estate brokers. It’s brokers like ours who make the deals that keep the economy growing. Referred to by locals as DFW, or The Metroplex, the region is made up of Dallas and Fort Worth. Additionally, it includes cities like Arlington, Plano, Irving, Frisco, and Carrollton. Dallas itself is a city of 1.2 million. Also, Fort Worth has over 800,000 residents. In addition, several DFW cities have more than 200,000 residents. On top of that, a number of cities have over 100,000 residents. Covering 13 Northern Texas counties, the Metroplex is Texas’s largest metro. On top of that, it is also the nation’s fourth-largest metro area. Additionally, it is and the largest inland metro in the country. Texas is one of the top states for doing business. Furthermore, DFW is one of the Lone Star State’s best places for business. Overall, the Metroplex ranks second in job growth for metros with over 1 million residents. Only New York/ Newark, New Jersey rank higher. DFW also hosts 22 Fortune 500 companies. This makes it 4th in the nation. What’s more, North Texas has a diversified economy. Also, the region has a comparatively lower cost of doing business than other metros. Some of the top industries are transportation, high-tech, telecommunications, aerospace/defense, healthcare, financial services, and retail. David Walters, Senior Vice President with Fort Worth’s Occupier Advisory and Transaction Services, calls DFW one of the top relocation destinations for people and companies. Because of this, he believes that favorable tax laws and business regulations will continue to benefit the region. As a result, the Metroplex will keep growing at a decent rate. Learn more about our Dallas-area commercial real estate brokers and our Dallas-Ft. Worth Metroplex commercial real estate services. After previously being second for square-footage-under-construction, DWF construction shrank. This came after almost 8.5 MSF of rentable commercial office space came online over the previous two years. Yet DFW still has more commercial real estate in the pipeline than any other metro region. As a matter of fact, it is the nation’s fourth most active market. Without a doubt, the DFW marketplace is booming. And our Dallas-area commercial real estate brokers are leading the charge. Throughout DFW, Dallas commercial real estate brokers work with various property types. For example, there are office buildings, medical office buildings, land sales, and self-storage facilities. Office Buildings — Many Metroplex submarkets have both Class A and Class B office buildings. Consequently, a Dallas CBD’s renaissance has attracted more tenants in recent years. For example, the law firm Simon Greenstone Panatier P.C. signed a 7-year lease, 24K SF Renaissance Tower lease. Medical Office Buildings — With 10,000 baby boomers reaching 65 daily, DFW medical facilities could be commercial real estate’s future. Even more than office buildings. However, these properties require special infrastructure. Facilities must accommodate modern medical technology, increased connectivity, and numerous medical devices. Land Sales — Growth in cities like New York, Los Angeles, San Francisco, and Chicago are limited by geography. Lakes, oceans, rivers, and mountains keep them in check. In contrast, the Metroplex can expand in almost any direction. On top of that, Former Dallas Mayor Tom Leppert says, “Dallas has more available land in the urban core than any other city in the country.” In particular, South Dallas has an abundance of undeveloped land. Moreover, the Metroplex has more available land than almost any other American city. In the end, DFW has great potential for land sales. Storage Units — Texas is considered the birthplace of modern self-storage. Over the years, the industry has exploded. These days, one out of every 10 American households rents a storage unit. If properly researched, then these facilities can become cash-cows for investors. Downtown Dallas CBD — This submarket has some of central Dallas’ best rental growth and office leasing rates. It also has some of the longest average lease terms. As a result, it is ideal for companies who want to be in the heart of Dallas. South Dallas — This industrial area has abundant, reasonably-priced land. Also, it is close to several major transportation arteries. In view of this, it is perfect for distribution, industrial, and logistics companies. Richardson/ Plano / Allen / McKinney — A new DFW business hub. High profile relocations (Toyota’s US headquarters to Plano and State Farm to Richardson) are boosting the area. As a result, there is increased growth and development. Central Expressway — This area has many existing Class A and B office spaces. On top of that, others are under construction. In addition, stable vacancy rates, and moderately rising rents offer a solid alternative to higher rents elsewhere. Far North Dallas — Has some of the DFW’s strongest growth. Not only that, but it also has the Metroplex’s highest concentration of construction. There are currently 42 MSF of rentable space in this submarket. Las Colinas/ DFW Airport — In the past few years, millions of SF of new projects have been completed. Because of this, Las Colinas has over 30 MSF of rentable space. LBJ — With almost 20 MSF of rentable space, LBJ has made a strong comeback in the office sector. This came after several years of decline. Uptown/Turtle Creek — An increasingly popular submarket. It has 11 MSF of multi-tenant office space, much of which is Class A.
Arlington / Mansfield — At the end of Q2 2017, this submarket led all DFW in quarterly direct net absorption gains. This is due to a new Class A project and several large Class B move-ins. Mid-Cities — One of the least active DFW submarkets recently. Due to higher vacancy rates, it is ideal for new office tenants. Fort Worth CBD — The heart of ‘Cowtown’ is still Fort Worth’s prime location. Furthermore, new projects have primed the CBD for even more new Class A tenants. Additionally, the 27-mile TEXRail will connect downtown Fort Worth to DFW Airport later this year. Undoubtedly, business travelers will be able to reach the CBD more easily. South Fort Worth — A desirable place to do business. It has one of DFW’s highest occupancy rates. CXRE offers various commercial real estate brokers services throughout the Dallas-Fort Worth Metroplex. 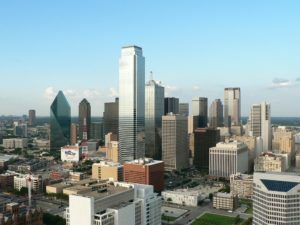 Learn more about our Dallas-area commercial real estate brokers and the DFW by reading: Dallas Commercial Office Leasing or Dallas-Ft. Worth Metroplex Commercial Property Management Services.